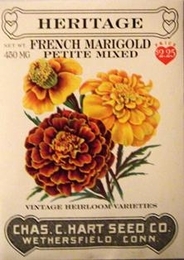 First found in Brazil in the 1500�s, the dwarf forms were so popular in Paris that they became known as French Marigolds. Considered tokens of good luck, the flowers were thought to ward off evil. Often started indoors 4-6 weeks before last frost they are easily grown by direct seeding in late spring after ground has warmed. Cover seed 1/4 inch with fine soil.